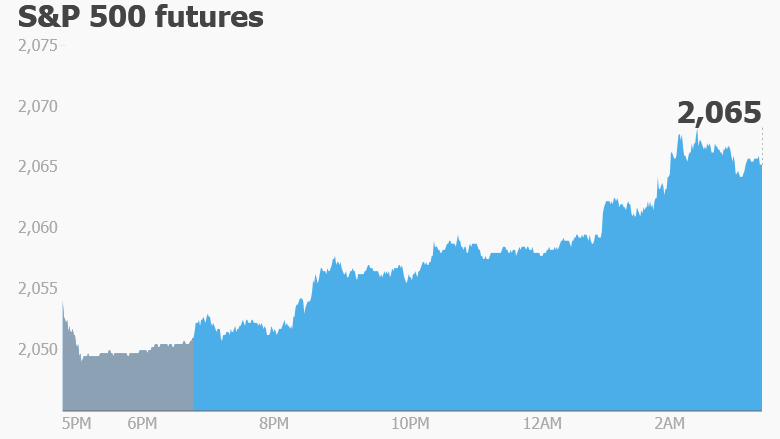 Global stock markets are getting a clear boost Tuesday. U.S. stock futures are up and nearly every major global index is rising. 1. Earnings: A number of well known companies are reporting quarterly results Tuesday. Ahead of the opening bell, we'll hear from SodaStream (SODA), Allergan (AGN), Credit Suisse (CS), Crocs (CROX), Dean Foods (DF), Lumber Liquidators (LL) and Nokia (NOK). After the close, Fossil (FOSL), Electronic Arts (EA) and Disney (DIS) are reporting. Shares of Disney are flat so far in 2016 -- despite box office hits such as "Captain America: Civil War," "The Jungle Book" and "Zootopia." 2. Stock market losers -- Gap, Takata: Shares in the Gap (GPS) are getting clobbered in premarket trading after the company warned that sales were down in April and in the first quarter. The company said its next earnings report, due May 19, probably won't make investors happy. Gap's stock was one of the worst performing in 2015, and it's down another 9% so far this year. Shares in Takata fell another 7.4% in Japan after the auto parts manufacturer warned it would report a $120 million loss for the past fiscal year, and that doesn't even include the costs of the expanded airbag recall. The future looks bleak for Takata, and some industry experts say the company may be forced into bankruptcy. It is due to report detailed earnings on Wednesday. 3. Monday market recap: It was a rather uninspiring day in the markets on Monday. The Dow Jones industrial average dipped 0.2%, though the S&P 500 and Nasdaq both eked out minor gains. Looking at individual stocks, McDonald's (MCD) made investors McHappy as shares hit an all-time high.